hernial protrusion of brain substance and meninges through a congenital or traumatic opening of the skull. occipital encephalocele an encephalocele in the occipital region, the most common kind seen in the Western Hemisphere. 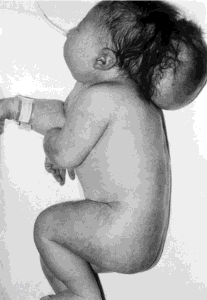 A baby with a large occipital encephalocele. From Mueller and Young, 2001. A deformed fetus with notencephalocele. a fetus affected with notencephalocele.